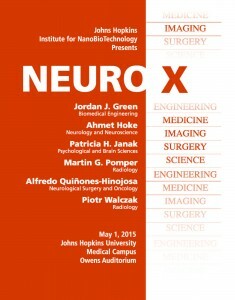 Johns Hopkins Institute for NanoBioTechnology (INBT) hosts its ninth annual symposium on May 1, 2015 in the Owens Auditorium on the Johns Hopkins medical campus. 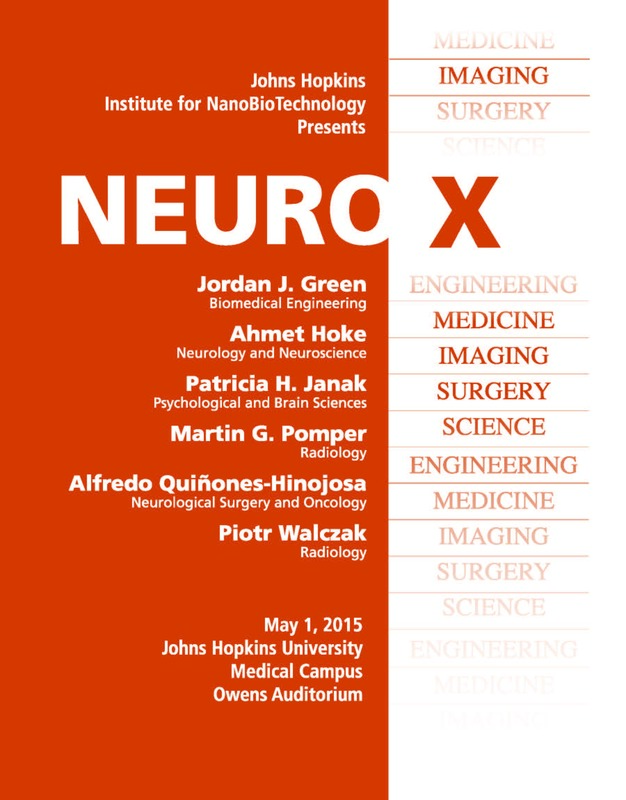 The theme for the speakers this year is Neuro X, where X stands for medicine, nanotechnology, engineering, science and more! Posters on any multidisciplinary theme are now being accepted. You do not have to be a member of an INBT affiliated laboratory to participate. Undergraduates, graduate students and postdoctoral fellows welcome. The event is free for Johns Hopkins associated persons. There is a fee for those outside of JHU/JHMI/JHH and is listed on the registration form. Full details on poster guidelines and current information on the symposium can be found on the Neuro X website. To submit a poster or to simply register to attend the symposium, click here. The symposium will begin at 8 a.m. with continental breakfast. Talks will begin at 9 a.m. and continue through 12:15 p.m. Speakers include: Alfredo Quiñones-Hinojosa, MD, FAANS, Professor of Neurological Surgery and Oncology Neuroscience and Cellular and Molecular Medicine; Jordan J. Green, PhD, Associate Professor of Biomedical Engineering, Ophthalmology, Neurosurgery, and Materials Science & Engineering; Ahmet Hoke MD, PhD, FRCPC, Professor, Neurology and Neuroscience; Patricia H. Janak, Professor, Department of Psychological and Brain Sciences/Department of Neuroscience in the Krieger School of Arts and Sciences; Piotr Walczak, MD, PhD, Associate Professor, Department of Radiology and Radiological Science; and Martin G. Pomper, MD, PhD, the William R. Brody Professor of Radiology and Radiological Science. This year’s symposium chairs are INBT director Peter Searson, Reynolds Professor, Materials Science and Engineering, and Dwight Bergles, Professor, the Solomon H. Snyder Department of Neuroscience, Department of Otolaryngology, Head & Neck Surgery. The poster session will begin at 1:15 p.m. and conclude at 3:30 p.m. with poster prize presentations. Speaker talk titles, poster prizes and other details will be announced in the next few weeks. Don’t miss your chance to participate in one of Johns Hopkins largest, most popular and most well attended symposiums. Plan now to attend and present.